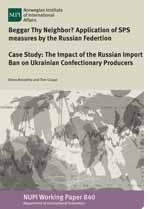 This project aims to provide new evidence on non-tariff barriers to trade in the Russian, Chinese, Ukrainian and other markets, and examine their cost and impact on trade. Focusing on Norwegian seafood exports and food imports into Norway and Europe, the project aims to shed new light on the role of non-tariff barriers in trade (NTBs), particularly focusing on SPS (sanitary and phytosanitary regulations). With an increasing role for NTBs over time, the project aims to shed light on the nature and importance of NTBs, and whether they affect small and large traders differently. Following the recent literature on international trade with firm heterogeneity, we distinguish between trade effects via the extensive margin (due to entry and exit of firms) and the intensive margin (because of changed sales volumes by firms already in the market). Some results indicate that NTBs particularly work through the extensive margin, by reducing market entry and thereby leading to market concentration. Other results indicate that even if NTBs affect the composition of traders, they do not always have a trade-reducing impact. 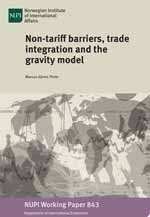 The intuition is that NTBs represent a fixed cost or threshold that the larger firms are more able to handle, but trade may continue to grow when firms have learnt how to cope with the regulations. The project examines these issues through a range of papers including econometric analysis of international seafood trade and Norway’s seafood exports; case studies on the role of NTBs for Norway’s seafood exports to China and Russia; and survey-based evidence on South American beef exports to Europe and Norway. The project is inter-disciplinary and also includes analysis of legal and institutional issues related to veterinary control in Russia, Kazakhstan and the Eurasian Economic Community; WTO rules and practices in the field; and SPS frictions between the EU and the USA. Results from about 20 papers was presented at the final conference in Oslo in February 2015.